At almost 90 years of age, the prolific, multi-disciplinary artist Yayoi Kusama remains as hard working and as popular as she’s ever been. Thanks to recent retrospectives, a new gallery and continuous collaborations with communities across the world, her mind-melting infinity rooms, spotted pumpkins and Godzilla-sized floral creations are seemingly inescapable. But we’re not complaining! Over the years the Nagano native has left her (spotted) mark across the globe, creating public sculptures, featuring in permanent museum collections and even infiltrating the skate scene. No matter where in the world you are there’s a good chance you’ll find a Kusama creation not too far away. 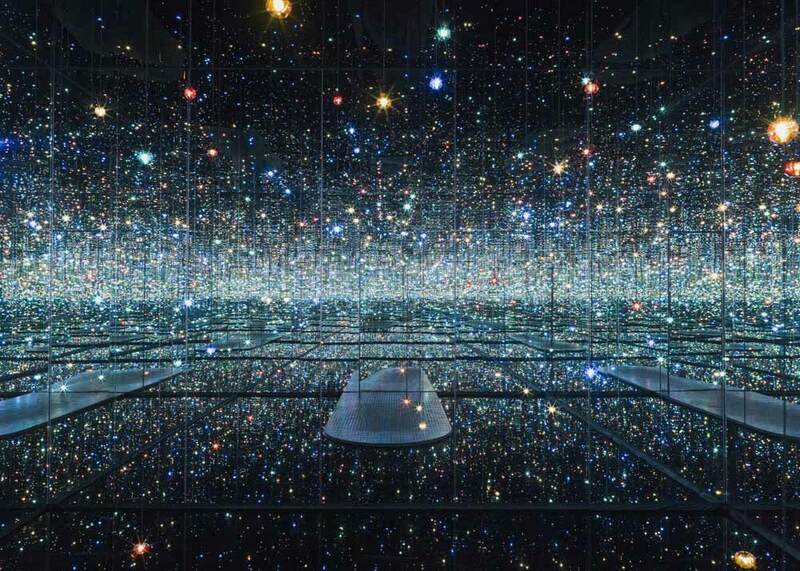 So no matter if you’re in Europe, America, Japan or Australia, if you’re wondering where to see Yayoi Kusama, here are a handful of places to keep an eye out for across the globe. Located in the creative city of Chicago, Wndr Museum is the genre defying, self described ’art and science pop-up museum experience’. Exploring the immersive world of Kusama’s work, the museum’s main focal point is its Infinity Room filled with floor covering and floating silver spheres. This exhibition is on until October 22, so be sure to book your tickets quickly! 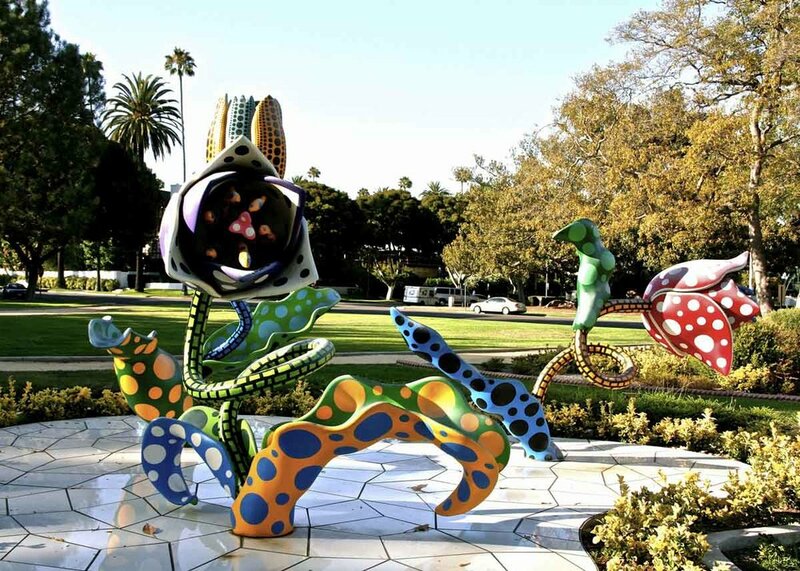 You can find a far more public piece by Kusama over at Beverly Gardens Park, N. Santa Monica Blvd. between Beverly Drive and N. Rodeo Drive. Titled Hymn of Life: Tulips, this outdoor sculpture was crafted in 2007. Made from fiberglass, ceramic tile and steel, and emerging from the ground in monster-like fashion, it’s one of Kusama’s most famous large-scale flower formations. If you’re a lover of both art and gardens, then take a look at our guide to the Best Japanese Gardens in the USA. Over on the other side of the country, the Tampa Museum of Art has recently unveiled Yayoi Kusama’s Love is Calling. The mirrored infinity room of the exhibition is populated by soft flowing tentacles, creating a kaleidoscopic space, while the artist’s voice recites poetry into the ether. Tickets are only available online, but you have until February 2019 to catch this one. A gallery that needs no introduction, The Tate is one of Europe’s most iconic contemporary art museums. Here as part of the Between Object and Architecture exhibition, - a collection of works curated to “create a dialogue with the materials and spaces of everyday buildings” - is where you’ll find Kusama’s 2005 piece The Passing Winter. 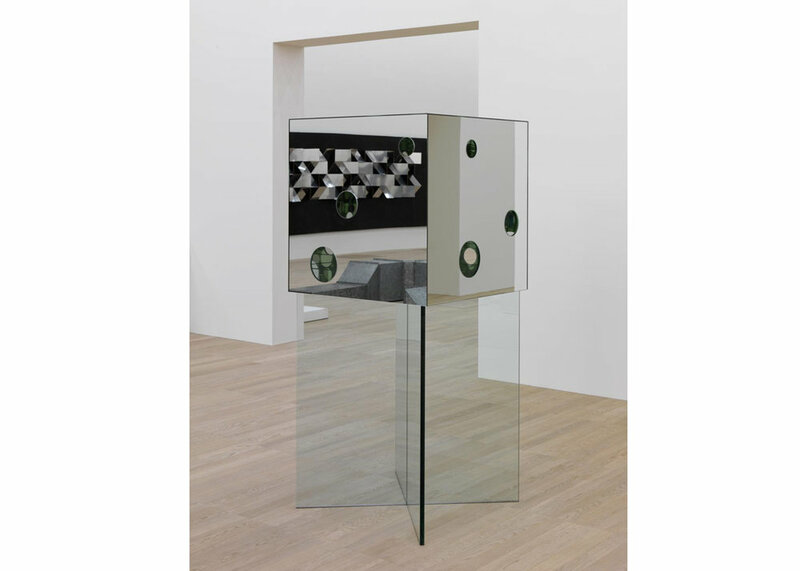 The piece is a sculpture made from mirrors on the outside and featuring an infinite mirrors on the inside too. Still a work in progress, it was announced earlier this year that a large Kusama designed public piece will soon be featured outside Liverpool Street station on London’s Elizabeth line. Titled Infinite Accumulation, it will be an amalgamation of many of Kusama’s most loved motifs: polka dots, 3D spheres and mirror effects. The swirling, almost gravity-defying sculpture will reach 12 meters wide and 10 meters high, and is one of 10 new public pieces to be released under the Crossrail Art Programme. The Moving Moment When I Went to the Universe exhibition at the Victoria Miro Gallery is testament both to Kusama’s enormous body of work, and her enduring popularity. Unfortunately that means that tickets to the exhibtion, which is on between October 3 and December 21, are very hard to get! Follow the gallery for updates on any new ticket releases. Standing an imposing 26 feet (eight meters) high in the middle of François-Mitterrand square, in front of the Lille railway station is Les Tulipes de Shangri-La. The piece was commissioned in 2004 when the city of Lille was dubbed the European Capital of Culture. It was also the first public sculpture by Kusama on the continent. Contrasting so vividly against the dull greys of the surrounding landscape, the sculpture is a creation taken from the artist’s Flower Power series. 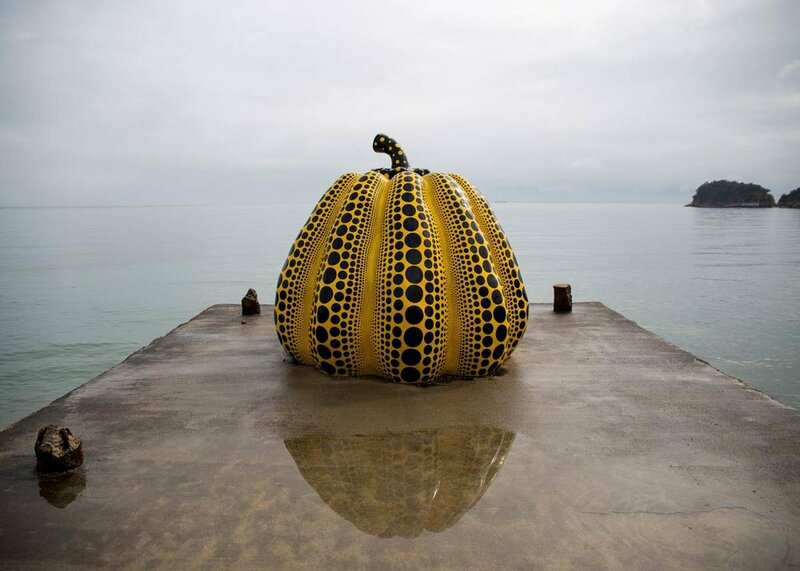 Undoubtedly one of the most famous pumpkins in the world, Kusama’s yellow dotted pumpkin on the pier debuted in 1994 as part of the art island of Naoshima’s Out of Bounds outdoor exhibition. Today the large pumpkin and its smaller red contemporary (also located on the island) are the unofficial symbols of Naoshima and its ongoing crusade to blur the line between art and nature. Over the years this spot has become one of Japan’s fastest growing tourist destinations with visitors across the globe making the journey to get a scenic snap in front of the gigantic dotted vegetables. Having opened in Shinjuku late 2017, this is the very first permanent museum dedicated to Yayoi Kusama, and it couldn’t have come at a better time. Even at 89 years of age she’s still tirelessly creating multi-disciplinary works, and the recent globe trotting retrospectives on Kusama’s earlier and mid-career life have sparked a resurgence in the popularity with mainstream and more niche fans alike. If you’re in Tokyo and have even a fleeting interest in her work, you can’t miss this. Tickets must be reserved in advance, so head on over to the website to get yours. While you’re in Tokyo check out the museum dedicated to another of Japan’s most famous artists: The Best Places to See Hokusai in Tokyo. So you’ve done the touristy one (Naoshima) and you’ve done the comprehensive one (Yayoi Kusama Museum) but you want to see a more unique display of Kusama’s work? Then you have to head out to the fields of Echigo-Tsumari in Niigata to witness Tsumari in Bloom. 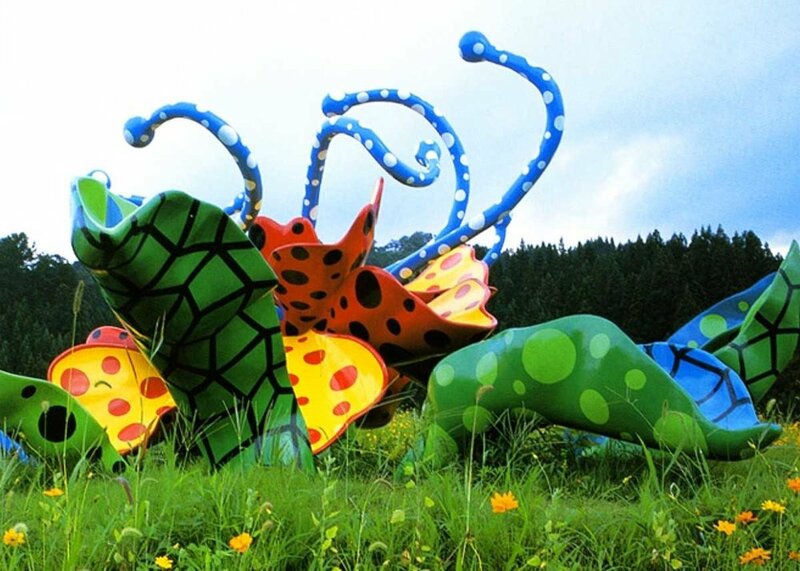 Another large scale public sculpture of spotted monster flowers, Kusama has been quoted as saying “Tsumari in Bloom is my favorite among all of the open-air sculptures that I have created for several places in Japan and other parts of the world.” So you know it’s something really special. It hasn’t happened quite yet, but as of December 2018, Canberra’s National Gallery of Australia will become the the permanent home of The Spirits of the Pumpkins Descended into the Heavens, arguably one of Kusama’s most instagrammable works. The immersive installation piece consists of rows upon rows of pumpkins backdropped by mirrored walls, giving visitors the illusion that they’re trapped right in the middle of an infinite universe populated by dotted pumpkins. The announcement comes after the artist’s exhibition immensely popular exhibit Yayoi Kusama: Life is the Heart of a Rainbow made its way down under late last year. 13. On Skateboards Across the World! 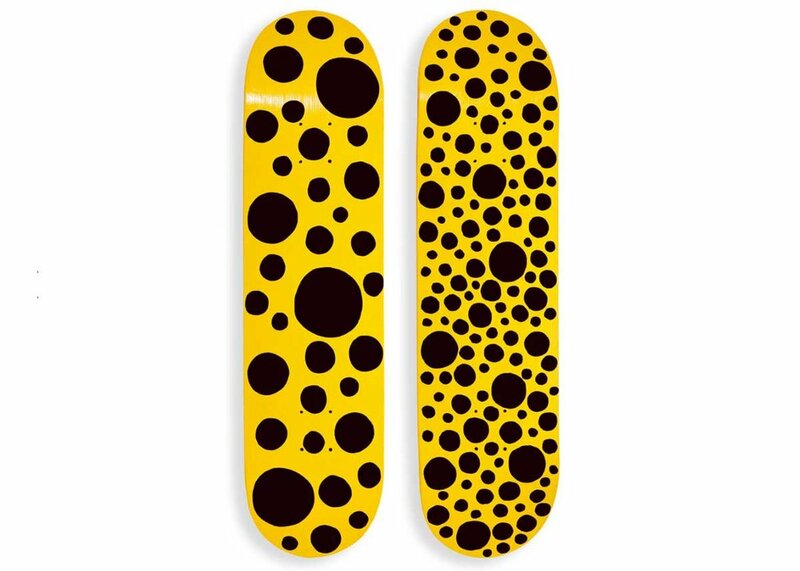 A collaborative effort between MoMA and Kusama, the artist also now has a series of skate decks in her portfolio. Two of the decks were spawned from her 2018 exhibition Dots Obsession, a collection of work that saw Kusama hone in on the psychedelic smattering of spots that have long now become her trademark. The initial version of these boards were digital renderings created from Kusama’s other works. However, upon reviewing them, Kusama decided they weren’t true to her vision and meticulously hand painted over the decks. The version you see now are as true to Kusama's hand-painted pieces as you can get. You can buy them online at the MoMA store. 14. In Theaters Near You! If you want to know more about Yayoi Kusama and her captivating art, you’re in luck. A new documentary by Heather Lenz traces the artist’s story from her early works in the New York art scene, through the many struggles and triumphs that have carried her to the very pinnacle of the contemporary art world. Find out where to see at screening at kusamadocumentary.com. Where do you think is the best place to see Yayoi Kusama’s works in person? Let us know in the comments below!